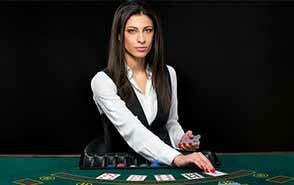 Many online casinos – and certainly all of the excellent casino sites we work with – now offer live dealer games. How to Play Live Dealer Casino? Traditional online casinos use Random Number Generators (RNG) to power their games, so when you play conventional online blackjack, there are no cards and no dealer, just the computerised representation of a game with the cards “chosen” at random by RNG technology. However, live dealer casino games seek to recreate something of the look, feel and authenticity of a real-life casino and rather than using RNG they use real people, real cards (or wheels, or whatever is relevant to the casino game you are playing) and play out in real time. The dealer or croupier is filmed, either in a purpose-built casino studio or in an actual casino, and you interact live and in real time with them when you play, just as if you were in a real brick-and-mortar casino. The croupier – invariably an attractive and scantily clad lady (though there are some male equivalents out there for the ladies!) – uses real cards and responds to your computer-generated bets and commands and you can even interact with them verbally via a messaging facility, as you can with other players at the table. Because live casino games involve real dealers and casino staff you will almost always find other players at your table, as, unlike RNG casino games, it isn’t possible to have an almost infinite number of tables and so, just like in a “real world” casino, you play alongside fellow gamblers. 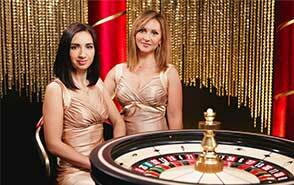 This is very much part of the appeal of live dealer casino games – they create a much more lifelike experience. As said, you can interact with you’re the dealer and your fellow casino players and the game proceeds at the same sort of pace that you would find in a traditional casino. Many people prefer a live dealer casino because they feel they can trust them more. All of the top online casinos we work with are 100% trustworthy and can certainly be guaranteed to use technology that is both fair and random, however, if you have any doubts then maybe a live casino is for you as you can actually see the cards being turned and the wheel being spun before your very eyes. 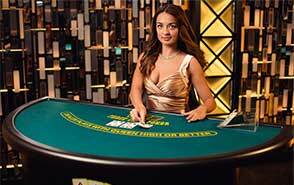 Live dealer casino games are certainly worth a try if you’ve never played them before, not least because they often have their own dedicated casino bonuses that can be claimed in addition to the main casino welcome bonuses casinos offers to new customers. They also make a pleasant change from the standard online casino games and are also very good if you want to settle in for a long session because they generally play out at a slower pace than RNG casino games, meaning your money will last longer, especially if you happen to be on a bad run of luck at the time. Live dealer casino games saw a large rise in popularity from about 2012 onwards but in actual fact, they have been around significantly longer. The first live games were played in around 2003, so they have been around considerably longer than many people think. Software supremo Playtech, who power many of the best online casinos, brought out the first ever live dealer games but in the early days the technology, both hardware and software and for both the casinos and the users, meant that live dealer games were nowhere near as good as they now are. Live dealer games use optical character recognition (OCR) technology to effectively convert a visual image into a form that allows the player to interact with what’s on their screen, and improvements in this technology, as well as more reliable and ever-faster internet connections, are what have helped live dealer casino games take a huge leap forward over the last few years. Live dealer games remain more expensive for online casinos to operate, due to greater staffing requirements (both in terms of technical support and the lovely ladies – and gents – who deal) and the need for a physical location in which to host and from which to transmit the games. 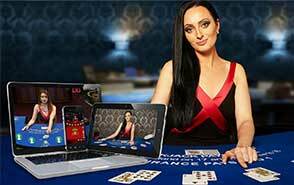 That said, more and more casinos are offering better and better live deal games and with this great option now available on mobile too there really never has been a better time to try a live dealer casino, either on your desktop, tablet or mobile. Playing live dealer casino games is just like playing the standard version of the games so please check out our blackjack or roulette game guides for information on how to play or our main game guide page for other casino options. The only real difference that you will encounter is, as said, the slower pace of the games, which is good if you prefer a natural speed but not so good if you have a large casino bonus to work through. The other factor to consider is, again, as mentioned, the fact that there will be other players at your table and as such you can’t always guarantee you will be able to grab a seat at the blackjack or roulette table that suits your stake. Waiting times are rarely long though and some casinos will allow you to join a waitlist or be notified when a spot becomes free. What Games Can I Play In Live Dealer Casinos? The main live dealer games, and certainly when it comes to those that are available on mobile, are blackjack and roulette, quite simply because they are by far the most popular casino games around. Certain sites do also offer one or two other games, including baccarat, craps, casino hold ‘em and/or a few other card games, but in general, it does tend to be very blackjack- and roulette-orientated. That said, as the other games grow in popularity and the technology improves – and the cost of hosting the games drops – we would expect more and more casinos to expand both their main live dealer games portfolio and their mobile live offering. The market for live dealer games is quite diverse nowadays, with multiple software providers competing against each other to supply gambling websites. These are companies that run the operations behind the end product and lease it to online casinos. In the current state of the industry, there are multiple companies that are heavily involved with the creation of live dealer games and below, we have outlined some of the major ones. Playtech is one of the largest software providers in the industry and it has consistently set trends and new standards since 1999. It currently offers one of the largest selections of virtual games, while also operating multiple studios across three different countries. The Latvia and Romania studios service the European and North American players, while the one in the Philippines accommodates Asian gamblers. Playtech offers a wide range of casino games, including a variety of Asian-themed titles. Furthermore, this software provider powers some of the largest brands in the industry. Microgaming is one of the original companies that started producing online casino games back when the industry was still in its baby years. Founded in 1994, this software provider has seen every major event of the online gambling world and has contributed much to its development. Despite being in business for more than two decades, Microgaming has never been in the shadows and has always maintained its position as an industry leader. Currently, it boasts one of the largest game libraries and it also offers a good number of live dealer titles. Currently, Microgaming operates their live casino out of Toronto, Canada and its presence is felt across multiple gambling websites. Evolution Gaming is not only the most prominent software provider in the live dealer market but also one of the companies that spearheaded the development of the genre. Evolution Gaming traces its origins back to the mid-2000s and it was one of the first companies to offer live dealer games. Nowadays, this company powers a large number of online casinos and theirs is one of the most recognizable names in the online gambling industry. Evolution Gaming operates out of five studios in as many countries, namely Latvia, Malta, Romania, Canada and Georgia. 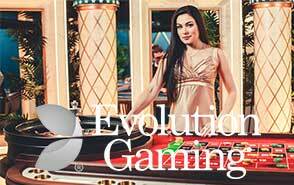 Additionally, Evolution Gaming streams from several land-based casinos for even more authenticity. With about 400 tables, this company is undoubtedly the leader in the live dealer scene. NetEnt is another old-school software provider in the online gambling industry. Established in 1996, it has had a large presence throughout the years, providing many online casinos with top-quality virtual slots and table games. In terms of live dealer titles, NetEnt has not been as dedicated to this genre as their other offerings. The company only began to develop their live platform when the competition was already well established and as such, NetEnt has struggled to gain a good market share. In the last few years, it has caught up in terms of the technology used and they can match other software providers where quality is concerned. Despite this, NetEnt live dealer games can only be found in a handful of online casinos. Extreme Live Gaming is the youngest company on this list, established only in 2013. Despite that it has made great progress in developing their tech, their product is not available at too many online casinos. Though, since their acquisition by the Novomatic Group, things are looking up. Extreme Live Gaming offers multiple tables of the most popular games on the market, streamed directly from their studio in London. Currently, Extreme Live Gaming powers some of the most reputable online casinos in the industry. The live dealer genre is not the most diverse out there, but the games that it does include are some of the most beloved out there. Each software provider uses their own formula, but there are certain trends that we can notice when looking at the bigger picture. Below, we will outline some of the most popular games played in the live dealer style. Blackjack is certainly the most popular of all live dealer sub-genres and it is also one of the best experiences that you can have while gambling on the Internet. The games put the player in full control of their hand, allowing them to fulfil the same actions that they would when playing the game in real life. Most live blackjack titles can accommodate between 6 to 9 players, depending on the software provider. The number of decks found in the shoe also varies but not by much, typically between 6 and 8 full decks. The dealer will reshuffle the card cards in the shoe after approximately half of the available cards have been played through, which allows for card counting to a certain extent. Since live blackjack is so popular, there are many tables out there for users to pick from and these come with very different betting limits, able to service both casual players and high rollers. Live roulette is also a popular option in modern-day online casinos and it is one of the most played game types presently. The game truly immerses you in the casino atmosphere and you can see both the dealer and the wheel as it spins. Bets are placed using a virtual layout, where you can see every potential betting option and its corresponding payout. Furthermore, there are usually also different tabs that allow you to track the progress of the game, for example, which numbers came up previously. Unlike live blackjack, live roulette does not require players to take a designated seat, allowing for an infinite number of players to attend, at least in theory. The most common roulette variation played in the live dealer genre is the European style, though one can also find American Roulette and other more modern iterations. Casino poker is another popular live dealer game type that you can find at online casinos. This game genre pits the player against the dealer in their attempt to get a better hand according to the rules of poker. Unlike other live dealer sub-genres, live casino poker gives users options when it comes to which variation they would like to play. Many software providers support multiple variations of live casino poker, more specifically, Caribbean Stud, Texas Hold’em, 3 Card Poker and so on. 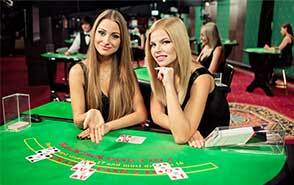 In terms of gameplay, all players place a bet on one hand that is shared by everyone and the dealer receives their own. After which, community cards may be dealt and players can decide whether or not they wish to continue placing bets or fold. The actions of one player do not have an effect on those of another, so for example, if one person folds, a different player can continue to play with the hand dealt. 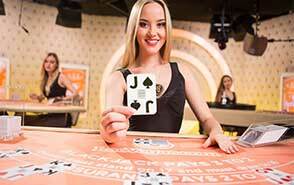 Baccarat is also supported by software providers and there are multiple tables at many online casinos. Baccarat remains mostly unchanged and the gameplay is no different than at any other gambling venue, whether it be land-based or virtual. Players still have access to the same betting options – Bank or Player, with some tables also offering side bets. As with the details of how to play the specific games, please see the main game guide section and the specific game information for odds, facts and stats.